A Cheshire couple are celebrating having more room for manoeuvre after part exchanging their three-bed apartment for a stunning five-bed detached Bovis Home. 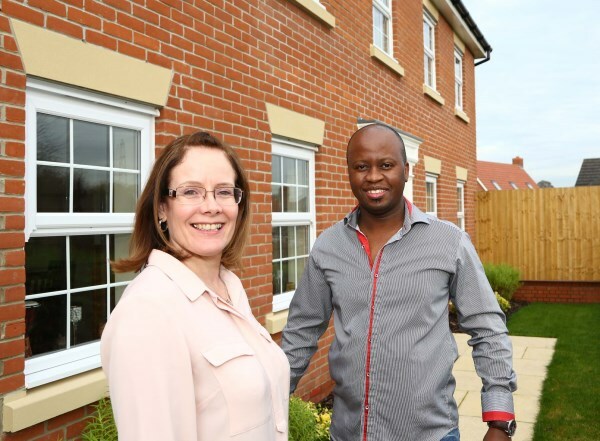 Dr Thari Ratladi and his wife Diane were second-time buyers when they moved into their brand new home in Wychwood Village, Weston, using the housebuilder's own Home Exchange scheme. And the couple couldn't be happier after making the decision to move because their old apartment had become unsuitable for their needs, particularly those of three-year-old son Theo. Diane said: "We were looking to stay in the area as it's perfect for my husband's work and we really like the local school too. But we wanted more of a family home, with a garden, which was really important for our son, and thanks to Bovis' Home Exchange scheme, we were able to move out of the apartment that we had outgrown and into a five-bedroom detached house with a nice big garden." The Ratladis bought the house off-plan and it was nothing more than a plot of land when they first fell in love with it. Diane explains: "We only lived round the corner beforehand. We saw the plot as we passed by one day and decided to have a closer look; then the neighbours in one of the adjacent houses offered to show us around their house. We fell in love with it instantly. It was perfect for us." She continued: "We had already decided we wanted to sell our apartment, but we were aware that others in our building had taken over 12 months to sell previously and this really worried us. We wanted to move as soon as possible. So, having seen the plot, we popped into the Bovis Homes office on the Wychwood site and spoke to the sales advisor, Jenny Hayes, and by the end of that meeting we had decided to go ahead with the Home Exchange scheme - it was just the perfect solution for us." When they saw the plans, the Ratladis were delighted with what their new home had to offer. Diane said: "It looked like it was going to be lovely. We were really pleased with what we saw. We loved the style of the outside, it has a lot of character, and the design inside is great too. We really like the flow of the house and the size of the rooms, and the amount of space we have now is fantastic. "As well as all that we have a double-garage, we're not overlooked, which is lovely, and the front of our house overlooks countryside. It's stunning, we absolutely love it." Describing the service they received from Bovis Homes, Diane said: "Bovis Homes made sure we were involved in every stage of the process, we had really good communication from the site manager throughout. Buying off-plan meant that we were able to design parts of the house ourselves - we got to choose our own bathroom and kitchen colours, tiles, cupboards, carpets and the like. We really feel like it's got our own mark on it now. "Our last place was a show apartment and it never really felt like we got to put our stamp on it. This one feels much more like home. It's those little touches that make the difference." Diane and Thari said that they received excellent customer service from Bovis Homes and in particular thanked Sales Advisor Jenny for her hard work and dedication. They said: The whole process was so smooth. We sat down with Jenny and she said 'just hand it all over to me and I'll do all the work.' She took on the bulk of the work and it all ran like clockwork. It was a big weight off our minds - we could just enjoy the experience. "Jenny was wonderful. She was always there whenever we needed her and nothing was too much trouble." The couple added that their new home has made a massive improvement to their lives, they said: "We're so happy, we keep pinching ourselves! Bovis Homes has been fantastic in helping us buy our perfect home." Wychwood village is a unique development of two, three, four, five and six bedrooms at Weston, near Nantwich and Crewe. The village is surrounded by an area of woodland, with close-by schools and amenities. It is also conveniently located close to the M6 motorway network and high speed trains link Crewe with London and other cities. For more information about Wychwood, Home Exchange, or any other Bovis Homes developments, visit www.bovishomes.co.uk.